It's not often that references to other games pop up in something like Diablo III but, following the game's latest patch, old-school Fallout fans will have something to grin about thanks to a new Easter egg hidden within the description of a new item. The folks over at Diablo Fans have done some good old-fashioned data mining for patch 2.4 and discovered an item bearing a name and description that's pulled straight out of the beloved Fallout series. Keep in mind that Diablo and Fallout are made by two different developers—Blizzard and Bethesda, respectively—making this fun little nod even more endearing. It's always great to see cross-company love in the realm of gaming. 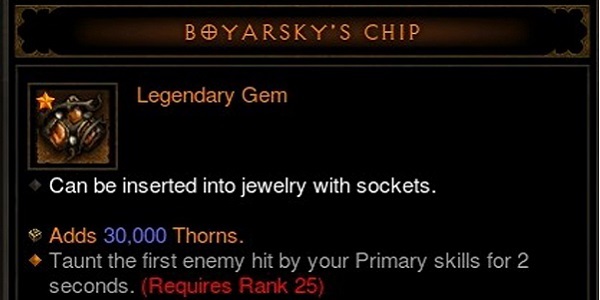 The item is called Boyarsky's Chip. It's a reference to Leonard Boyarsky, who worked on both series. As for the item itself, this legendary gem can be inserted into a piece of jewelry with sockets in order to add 30,000 Thorns and taunt the first enemy you strike in combat. Following is the rest of the item's description, which is full of nods to the Fallout series. Since this patch just came out and so did Fallout 4, the timing couldn't be better. This fragment of a gem, called a chip, was discovered in an underground vault by old man Boyarsky, who fashioned it into the beautiful gem it is today. It damages those who would damage its owner, and once inserted into a socket, it will never fall out. In case you're wondering, this bad boy can only be sold for 16 gold, so it's probably best to use it as intended and get to bashing some baddies. Finding Easter eggs like these is always a delight and helps remind us that there are real folks working on these video games who have their own nerdy love for various other games and pieces of pop culture. Call of Duty recently let its Doctor Who flag fly with some killer manequins and both the Wolverine game and Just Cause 2 had nods to the popular television series Lost. Actually, that same Wolverine game boasted a hidden sword that was pulled straight out of World of Warcraft. *This is a flat-out lie...Maybe.